Please take a moment to empty your heart of sin and self and ask God to fill you with His Holy Spirit. If you haven’t already, please read 2 Peter 1:3-7. According to verse 3, what has God given us? Did you notice that God has given us everything we need to live a highly effective successful Christian life? Have you ever thought you were unable to bring a certain area of your life under the control of the Holy Spirit? I know I have. But, God has given us divine power to overcome our flesh and live by the Spirit. An untamed area of sin is no match for the power of God. How can we begin to unleash the divine power God made available to us (verse 3)? By knowing God. The original Greek word for knowing used in this verse is epignosis which means precise and correct knowledge, to become thoroughly acquainted with, to know accurately, to know thoroughly, to perceive, ascertain, to understand (BLB). How do we acquire this kind of knowledge of God? By studying His holy word; a cursory glance at a few verses each day won’t cut it. We need to dig in deep, investing our time and ourselves in order to know God. What else has been given to us (verse 4)? “Exceedingly great and precious promises” have been given to us, which are recorded in the Bible, enable us to partake of the divine nature of God. Please list everything we are to add to our faith mentioned in verses 5-7. Now let’s take a quick at what each of these concepts mean in the original language. Virtue: a course of thought, feeling and actions concerning modesty, purity and moral excellence. Knowledge: knowledge of lawful and unlawful things for Christians, right living. Self-control: “the virtue of one who masters his desires and passions, esp. his sensual appetites” (BLB). Perseverance: the characteristic of a man who is not swerved from his deliberate purpose and his loyalty to faith and piety by even the greatest trials and sufferings. Godliness: reverence, respect, to be well off, to prosper, acting well, to revere, to worship. Love: the love of God, love that always acts for the best interest of the recipient. Which of the above virtues do you need God to develop in your life? If you feel discouraged by lack of progress in one of the above areas, remember you have access to His divine power. And He is greater than your sin. Power up and press on! Filed Under: Take 5! 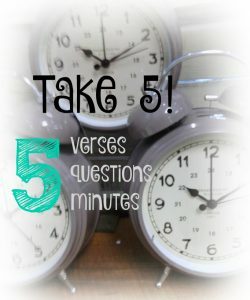 Tagged With: 2 Peter 1:3-7, How to know God, knowing God, quick Bible Study, short Bible study, Take 5! Thank you for returning for another Take 5! Bible Study. Before we begin our study time today, please take a moment to pray. Ask God to ready your heart, mind and spirit to receive from His Holy Word. If you haven’t already, read the verses above. Name two things from verse 6 which nourish us. We are nourished by words of faith and good doctrine. The word nourish transliterates as entreph. Entreph and its derivatives mean “to nourish or fatten a person, to educate the mind, to bring up, to nurture.” The truth of God’s Word is the only thing we should feed our heart. It enriches the mind, body and spirit. Two types of exercise are mentioned in verses 7 and 8, godly and bodily exercise. While we are all very familiar with bodily exercise, what does exercise in godliness consist of? Matthew Henry states exercising godliness is “ceasing to do evil and learning to do well.” We must stop living to gratify our own desires and learn what God wants us to do by studying, praying and meditating on His Word. The Greek word for exercise is gymnazo. Gym—exercise. Very fitting. Its definition is rather … huh … interesting. Gymnaz0 means “to vigorously exercise the body or the mind, to exercise naked.” We come before God with souls uncovered (naked), admitting our sin and our need for Him. That’s exercising godliness in the raw. Why is exercise in godliness more beneficial than bodily exercise? Bodily exercise gives us life. Exercising godliness gives us life and eternal life. Life for the here and now and life for forever. What words come to mind when you think of exercise? Blood, sweat, tears, pain, perseverance — words that also speak of the Cross. The Cross is an exercise of love and grace. Like all exercise, exercise in godliness is painful, critical and beneficial. Without it we may exist, but we will never flourish. What are we to do after we have suffered and labored to exercise godliness (verse 11)? We turn and teach others what we have learned. Just as we love to exercise with a friend, we ask others to join us in the journey. Thank you for studying with me today. Be strong in the Lord. Please comment below and let me know how you will exercise godliness today. Filed Under: Daily Bible Studies, Take 5! Tagged With: 1 Timothy 6:6-11, quick devotions, short Bible study, spiritual health, spiritual work out, Take 5! I am a list maker. I like to start out my day with a list of tasks I need to complete. I feel great satisfaction in accomplishing and crossing items off my to-do list. God is a list maker as well, the 10 Commandments is perhaps His greatest to-do list. In 1 Peter 4, God gives us another list: four things to do when we are suffering. Please take a moment and go before God in prayer. Confess to Him any sin, and ask Him to fill you with His Holy Spirit. Please read 1 Peter 4:13-16, 19. In verse 13, what is our first to-do when we are suffering? How deeply are we to rejoice? The word for rejoice used in verse 13 is chairo, which means, “to be well, to thrive, to be glad.” It also means, “let the hope of future blessedness bring you joy.” So while we are suffering we must focus forward, knowing God has a great blessing for us. To the extent we have suffered, we will be blessed! Verse 16 names another suffering to-do. What is it? The word glorify means “to praise, to honor, to make renowned.” If God wants us to praise Him through our suffering, there must be some thing praiseworthy in our suffering. If we can’t see anything praise-worthy at the moment, let’s praise by faith. Verse 18 names two more to-do’s when suffering. Please name them. We are to trust God is good, and continue to do good. The temptation when suffering is to become self-focused. When our attention is completely riveted on our pain, it intensifies. Doing good brings healing to our souls, encourages others, and glorifies God. Name one item from the to-do list you will do and how you will accomplish it. Thank you for joining me today for Bible study! Filed Under: Bible Studies, Daily Bible Studies, Devotions, Take 5! Tagged With: 1 Peter Bible study, glory, List maker, quick Bible Study, suffering, Take 5! When I was in elementary, a teacher presented us with a social studies activity that was very in vogue at the time. The topic was, “If your house caught on fire and you only had time to retrieve three items what would you take?” or something thereof. The objective of the assignment was to reveal what a person valued and cherished. It was interesting to hear each students fire list, but of course no one’s fire list could compare to your own. We all have things we treasure. Many of my priceless treasures are stored in my cedar chest in my living room. While I doubt anyone else would count the contents of my cedar chest as valuable, to me they are priceless. Like my cedar chest, our hearts also store treasures; keepsakes of experiences and happenings of bygone days we have tucked away to relive and remember. Memories … some good … some not so good, but we do have a choice as to what we shall keep in our hearts to treasure . To do Take 5! 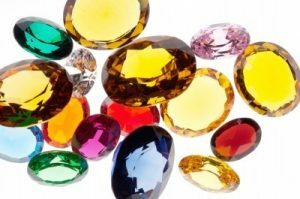 Treasure, please click on the link below. Have you ever wondered if God would use a person like you to help spread His Gospel? The answer is yes! To do the Take 5! Bible study, I Am Because He Is! please click on the link. Filed Under: Bible Studies, Take 5! 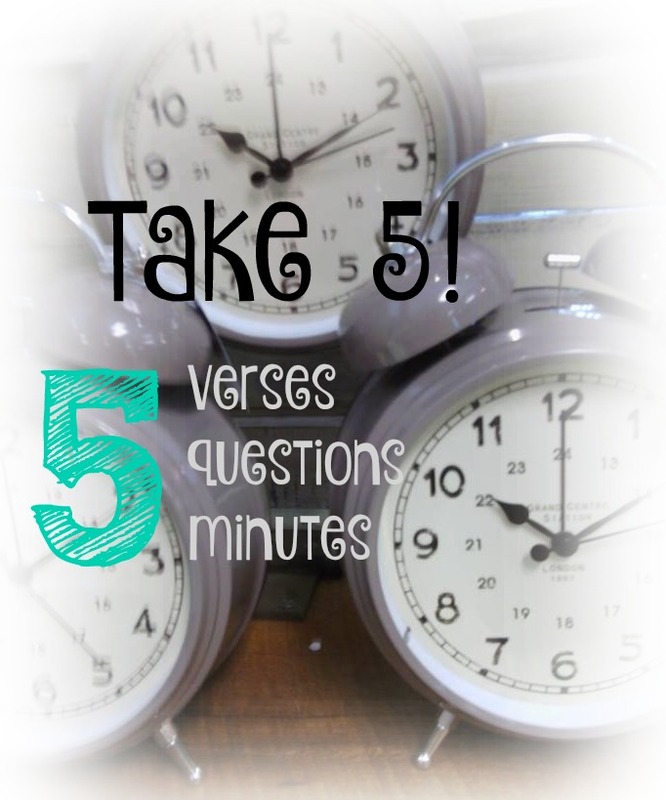 Tagged With: 2 Corinthians, Bible study, Can God use me?, Grace, His grace is enough, Take 5!